Engraving by René Boyvin?, 10.3 x 14.5 S (Vienna). Robert-Dumesnil, VIII, 1850, 21, 10, as apparently by Boyvin, after Rosso. Le Blanc, 1854-1890, I, 506, 10, as Boyvin after Rosso. COLLECTIONS: New York, 32.92.27 (5). Vienna, F.I.3, p.41, no. 7. Destailleur, 1895, 276, no. 1145, as Boyvin after Rosso. Kusenberg, 1931, 160, as Boyvin after Rosso. Linzeler, 1932, 167, mentioned the attribution to Boyvin with design after Rosso. Levron, 1941, 74, 166, as shop of Boyvin, after Rosso. Boorsch, 1988, 9, Fig. 3. 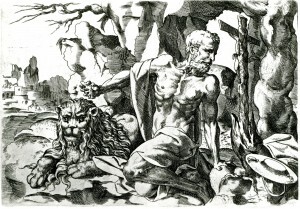 Kusenberg stated, and Levron repeated, that this print is related to Rosso’s drawing in the Louvre (Fig.D.45a), but the drawing shows a wholly different composition. 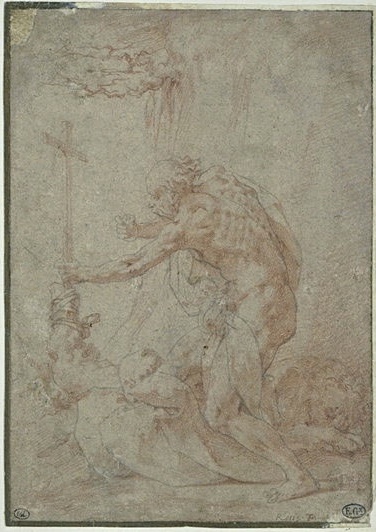 The earlier attribution of the design of this engraving to Rosso, recorded by Robert-Dumesnil, was apparently made without any knowledge of the Louvre drawing. However, the print is not related to Rosso’s style in spite of the anatomical specification of the saint’s body, which probably encouraged an identification of it with some of the emaciated old figures by Rosso. 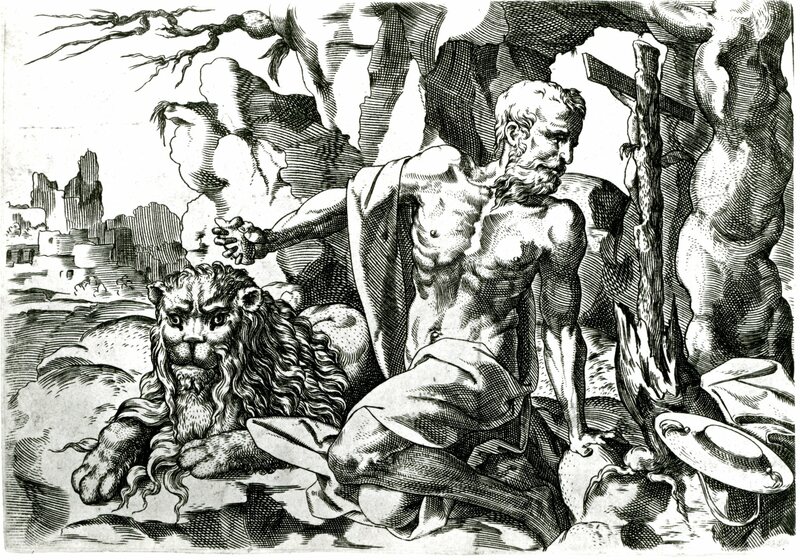 One need only compare the print with Rosso’s St. Jerome drawing to see how the arching and connecting rhythms and the patterns of the drapery and the anatomy in that image are quite unlike what appears in the engraving. It is possible that Rosso’s drawing, or a similar lost work by him, was an inspiration to the designer of the print, but the latter does not seem to be closely dependent upon a single composition by Rosso. It is not certain that Boyvin is the engraver of the print.